How to choose Coffee Brewers? Choosing the right coffee brewers can become a very daunting experience since there are so many coffee makers in the market that cater to different needs. This article aims to help you make your choice not by recommending popular brands of brewers, but by listing down steps and guidelines that would help you narrow down your search and ultimately help you purchase the coffee brewer that will serve your needs the best. First of all, what type of coffee do you like to drink? Do you like to drink brewed coffee, espresso, or both? Some coffee brewers can make both coffee and espresso. In fact, some are even coffee, espresso, and tea brewers as well. Therefore, you don’t need to buy separate machines, unless you prefer and can afford to buy separate units. Second, how many people in your house drink coffee? Do you drink large quantities of coffee in a day? If you only drink one or a couple of cups a day, then it would be wise to search for a single cup coffee machine. However, if you want to use your coffee maker to brew coffee when you have guests in your home as well, then you should be looking at the different 10 cup coffee brewers that can also brew a few cups, which you can definitely benefit from when you’re only brewing for yourself. In other words, determine the brew size that would fit your needs the best. Third, what features are you looking for in your coffee machine? Do you want a non-automatic coffee maker or one of those fully automated coffee brewers? If you want to wake up to a freshly brewed pot of coffee every morning, then a fully automated coffee maker is the right one for you. Fully automated coffee makers are very convenient and brew coffee with just a touch of a button, thus those cater to people on the go. Similarly, some coffee machines come with permanent coffee filters, which eliminate the need to stock up on disposable paper filters. If you don’t want to be bothered with buying paper filters regularly, then it would be wise to buy a coffee machine that comes with its own permanent coffee filter. Fourth, which of those coffee machines, which would best serve your needs, are going to fit your budget? Check local and online stores and you might be able to find great deals and save money. Setting your budget will also help you avoid overspending. Now that you know what type of coffee machine that you are looking for, you now have a short list of coffee machines that cater to your needs. The last step is to read expert and customer reviews and compare the different brewers in your list. Expert and customer reviews are very helpful and will ultimately help you make you decide which machine you’re going to purchase. Since those are written by people who have already used the particular coffee maker you’re planning to buy. These reviews will state if the coffee machine performs up to expectations or not or if it even exceeds expectations. If you’re planning to buy a coffee maker, these five steps will help you narrow down your search. Hopefully, you’ll be able to find the right coffee brewer that will serve your particular needs. Which Pod Brewers Should You Choose? The pod brewers or single serve coffee makers that one chooses, depends on the amount of money, the uses and the coffee that you are looking for. Not may people would consider coffee urn useful, but this big coffee brewer does have it use in functions and places where high turnover of coffee is required. Doing a tassimo review is relatively easy because there are only two different tassimo machines for you to choose from, and usually folks would go for the latest model. This is one coffee makers pod machine that is very low cost and yet still does good coffee. How low it is, lets say you can get it below $50! The Jura Impressa C5 is a very popular automatic coffee machine, it has reign in this genre of coffee machine for a long period of time, could this be that best coffee maker? Best Cappuccino Machine Is By Briel? Keurig Single Serve Coffee Maker, What About It? You must have heard of keurig single serve coffee maker, do you know what it is that make it so popular? In fact, what it is that make single cup coffee brewer popular? When people talk about industrial coffee machine, they usually meant machines that would be used in offices, restaurants and cafes, and here are some things you need to take note. Being able to grind and brew immediately ensures the freshest brew. Then again, you would want to know which is the best bean to cup coffee machines around right? Kitchen aid pro coffee maker is just one of the many good coffee makers around. It has features that would better your coffee experience and we thought it is a good deal. When shopping for under the counter coffee makers, most people would think about Black and Decker space maker. But have anyone heard of contoure coffee maker before? What are Vacuum Coffee Makers and How Does It Work? Vacuum coffee makers might be a very old method of brewing coffee, but it is not that difficult in using it to brew coffee. In fact, this coffee brewer is quite easy to use. 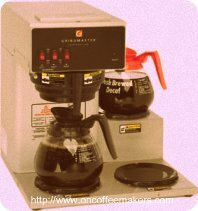 One of the ways to buy a good coffee brewer is to look through the more popular coffee machine makers. There are reasons for the coffee companies being popular right? Where to Get Honest and Accurate Coffee Maker Information? You would need more coffee maker information if you want to find a coffee machine that is suitable for your usage, the question is where can one find such reviews of coffee machines? How do you like Bloomfield coffee? Do you like bloomfield coffee? Never heard them? I can almost be sure that you have drink this coffee before, if you have been to a fast food restaurant. Why is the Bunn Coffee Brewer CWTF-15-2 so Popular? Some coffee drinkers wonder why is the bunn brewer CWTF-15-2 found in so many cafes and coffee shops. Here, we give a break down on this fine bunn coffee maker. How to choose drip coffee makers? Why Keurig Brewers are Popular? Is a Coffee Grinder inside brewer Better or Worse? Have A Great Story About Choosing Brewers?